WOW!! 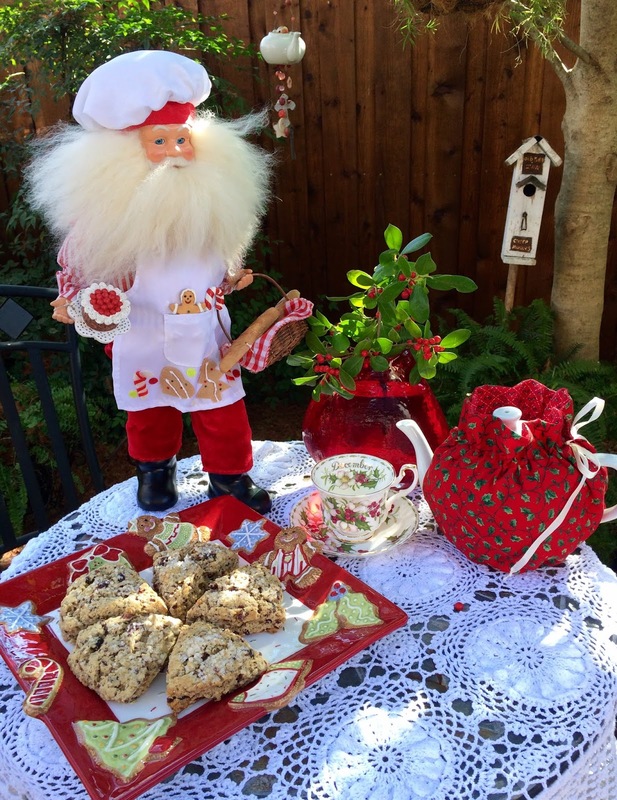 !What an AMAZING post,Kitty!That Santa is so cute and your table is gorgeous!I love the stunning teacup and your pretty tea cozy,how beautiful!The tablecloth is wonderful!Thanks for the recipe.Hugs to Cissy and you! Your husband would be so delighted that Cissy is helping you carry on the jam making tradition. Scones. I adore them and so seldom bake them because I would eat the entire batch and they don’t taste as fine the following day. But I have company coming this week and scones would be lovely. 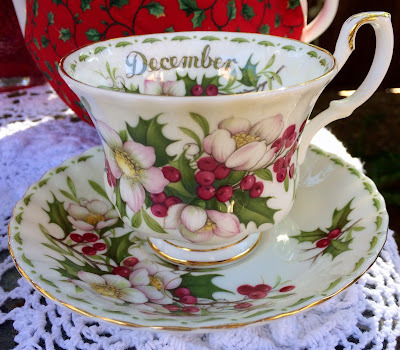 I love your December tea cup! And I have all the ingredients for the recipe! Maybe I'll make scones today! Holiday hugs! What a pretty tea table setting outside! Love that teacup and your scones look so good. I will have to bring out my December teacup as soon as I finish my Christmas ABC's series. I cannot imagine having tea outside this time of year. We had a snow storm last week and it shut the whole Island down. We were without power for twenty-three hours and it was extremely cold with no heat or lights. We have a pellet stove but if there is no electricity, the stove doesn't work. I can't remember ever losing our power for that length of time in the wintertime. Hope that never happens again! I can just imagine all the fun you and Cissy have in your kitchen! She's obviously taking after her Nana. Happy December, my friend! Hugs! What a festive tea time. Your Santa is too cute and the tea cozy looks great! Your table is so festive, Kitty. Love the Santa, your tea pot all dressed up, the December teacup and those delicious looking scones. Sissy looks pretty in her apron. 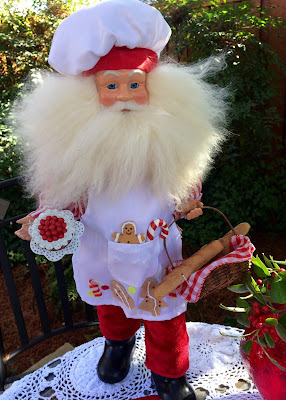 What a cute baker Santa! 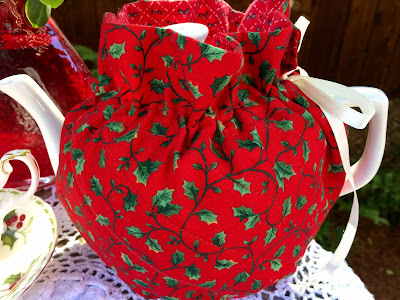 I love the idea of making jam for Christmas gifts. I usually only make jam in the summer after we go strawberry picking. Love your Royal Albert teacup too along with the tea cozy you made! You certainly have many talents. Happy first week of December! What a sweet memory you were able to relive with your dear Cissy! She is just precious and such a friend to you, as I know you are to her. It is so inspiring to see how close you are to your precious grandchildren. May the Lord bless all of you this Christmas season! Oh, what a sweet and charming post, my friend. Everything looks so beautiful and festive :) LOVE your pretty tea cozy and oh, your scones look divine. Wishing you a most wonderful day. Love you! Mmmm...and I'll bet it was extra delicious with sweet Cissy's help! The scones look divine and I love the holly! We have a huge holly bush in the backyard but it doesn't get berries every year. Last year it was full and I love to decorate with it! Love & hugs to you! SO jealous that you can do that outside!!! It's been miserable here lol. Cissy looks so grown up in that picture!! I love scones . . . but I'd love them more if I were eating them outside like you haha! Well, I SUPPOSE I could but I'd be frozen and so would the scones! What delicious looking scones. It's too chilly to enjoy tea outdoors here, but I'm sure they would taste just as wonderful beside the fire. I'm glad you have Cissy to help you make your Christmas jam. I'm off to look at that recipe. Oh Kitty this has me positively grinning! Your Chef Santa is so cute with his cookie tray full of Christmas scones and holiday tea! The tea cup is simply beautiful! It makes my heart sing to see Cissy cooking with you, and now she has graduated to jam! New special memories for your jam! I hope December is full of more memory making times with your family! Oooh, the scones sounds delicious, Kitty! What a beautiful teacup your friend gave you. A very special one, indeed, and your tea cozy is adorable :) So is your kitchen helper! Kitty, what a sweet holiday tea party! Love the tea cozy you made. I don't feel much like baking lately but I will save this recipe for when I do. I ♥ scones! 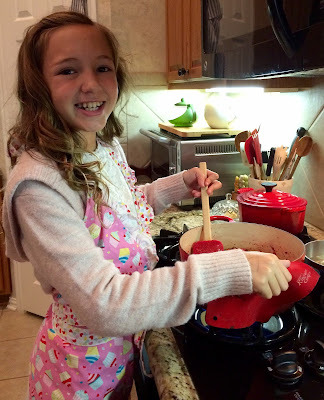 Your Christmas Scones look amazing and your helper is adorable! Hope you are enjoying your week and thanks so much for sharing with us at Full Plate Thursday! 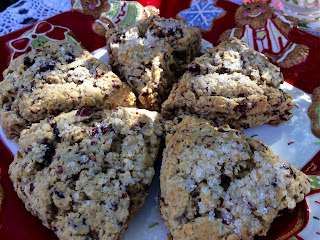 I love scones so I am pinning this to use at my Christmas brunch! I even bought a scone pan which makes the whole process of making and baking so much easier. These sound delicious.